You are here: Home / Guides / Closed Loop Systems: Future Treatment for Diabetes? Having Type 1 Diabetes sometimes seems like a chore, testing, needles, making sure you’re eating correctly, and more. There are some days it’s just all too overwhelming. With technology moving faster than ever, you’d think there would be an easier way than sticking your finger every few hours and then figuring out how much insulin to inject. There is good news for those with Type 1 diabetes, science and technology have finally come together to create the artificial pancreas. We’re just a few small steps away from not having to wake our children up in the middle of the night to test their blood glucose levels. Or what if you didn’t have to worry about being late to a meeting because you were injecting insulin? Companies like Medtronic have paved the way into bionic management of Type 1 Diabetes and their device could be coming to you sooner than you think. Unlike the name implies, an artificial pancreas does not work exactly like a person’s biological pancreas. It is a device, not an organ, that requires a system of pumps, monitors, and algorithms to deliver insulin and glucagon directly to the patient. It’s not surgically implanted into a patient, rather it’s attached to the patient’s abdomen, on the outside of their body. Artificial pancreas’ are only for patients with Type 1 Diabetes. The system automatically monitors blood glucose levels, every 5 minutes, and provides the right dose of insulin or glucagon if needed. Algorithms are set in place which link the monitor to the pump. 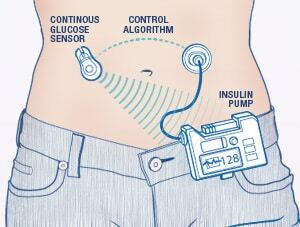 Some other names for the artificial pancreas include closed loop device and bionic pancreas. Patients who have an artificial pancreas will have more freedom and less stress about having to test, monitor, and administer medications for their Type 1 Diabetes. What Does Closed Loop Mean? Healthcare providers like the term “closed loop” better than artificial pancreas but both terms are used to describe the same device. Closed loop means the system monitors blood glucose levels, uses an algorithm to determine if insulin is needed or not needed, or if glucagon is needed or not needed, and then gives the dose directly to the patient. A closed loop system requires no action on the patient’s part, everything is done automatically by the device. Again, closed loop is just another term for an artificial pancreas, but it’s the preferred term in the healthcare world. Currently there is only one FDA approved artificial pancreas for use in the United States; and it’s only for Type 1 ages 14 and older. Medtronic released their MiniMed 670G in the Spring of 2017 to a select group of people with Type 1 diabetes. Medtronic is making sure all users are trained and well versed using the MiniMed 670G before they release it to the public later this year. But so far, it’s greatly eased the lives of those who are testing it out. They don’t have to worry about their blood sugar level dropping through the night because the MiniMed 670G is taking care of them, monitoring and providing insulin as needed. Patients are saying the MiniMed 670G is making their lives easier. And who doesn’t want that? There are other competitors who have devices in the works. Cellnovo, Diabeloop, and Dexcom just launched a study in May 2017 testing their closed loop insulin delivery system. They are using Cellnovo’s insulin pump, Dexcom’s continuous glucose monitoring system, and calling their artificial pancreas Diabeloop. Diabeloop is currently undergoing clinical studies in Europe and they hope to have it on the market in 2018. Time will tell if Diabeloop will be available to the American market, so far they’re only marketing to Europe. Humalog Vs. Novolog: What’s the Difference? Diabetes Care & Management: How Can I Measure My Progress? Tandem Diabetes Care is another company that’s working on developing an artificial pancreas. Tandem is working with Dexcom and Type Zero Technologies in a National Institutes of Health (NIH) and the University of Virginia clinical trial. Their artificial pancreas uses Tandem’s insulin pump, Dexcom’s G5 sensor, and Type Zero’s algorithm app called inControl. They want their system to be simple, proven, and trusted. It is unknown when clinical trials will wrap up but they are focusing on giving patients the best closed loop system on the market. Most recently, in July 2017, Abbott and Bigfoot Biomedical published a press release stating they are partnering together using Abbotts Freestyle sensor and Bigfoot’s insulin delivery system. They plan is to make a consumer friendly artificial pancreas that’s affordable and accurate. Clinical trials are set to begin in 2018. No matter which company or group is collaborating to make their closed loop systems, they all have a few things in common. First, they’re all automatic – No more testing throughout the day, no more waking up overnight to prick your finger and read your meter. This will make the lives of all users much easier and reduce their stress. And less stress equals a more stable blood sugar in general. Second, computer algorithms will monitor and send data to the user’s smartphone and some devices can also share information with your doctor for closer monitoring. This will also make it easier to keep insulin levels controlled and stable. Because the algorithms are so sensitive to changing blood glucose levels, they could eliminate hypoglycemic and hyperglycemic episodes altogether. That’s almost the best scientific discovery since insulin itself. Is the artificial pancreas the future to managing Type 1 Diabetes? Only time will tell. Currently, only a third of Type 1 patients use a pump to help control their diabetes. It’s hard to tell if patients will want to adapt to the artificial pancreas closed loop system. There are equal amounts of studies saying a pump is better or regular monitoring and injections are better. So, it really comes down to patient preference. And there are still some kinks that need worked out. For example, Type 1 Diabetics still need to take a bolus at meals to help regulate insulin on some of these artificial pancreas’. That’s not much different than a regular pump. It’s also important to recognize that diet and exercise play a role in both Type 1 and Type 2 Diabetes. Make sure to download our diabetes management guide here. One New York doctor said the devices could eventually be used to manager Type 2 diabetes. He said there’s a large population that would benefit from an artificial pancreas. There is a huge population of people with Type 2 diabetes who have numerous health conditions and if these devices could help them manage their blood glucose levels, that’s a healthy step on their road to optimal health. Medtronic is also undergoing studies on children ages 7-14 to see if their device could be a benefit for the younger population. This would be a great relief to many parents who worry and have to prick their children’s fingers to check their blood glucose levels overnight. Also, it’s still unknown if insurance companies will cover the closed loop devices or not, and they are not cheap. The Medtronic MiniMed 670G is estimated to cost between 6 and 9 thousand dollars out of pocket. Asthma and Diabetes: What’s the Link? Artificial pancreas’ or closed loop systems are a great advancement when it comes to managing Type 1 Diabetes. Some may argue it’s the best development since insulin. So far, patients seem hopeful and excited that their lives may be made easier with the artificial pancreas. The verdict is still out because the devices are still in trial phases. Medtronic’s MiniMed 670G is currently being tested by a select group of Type 1 pouplation in the United States. Medtronic seems to be the standard that other companies are going to have to measure up to. Other companies are teaming up to combine their best products to make one great artificial pancreas. There are still some kinks, however, the artificial pancreas looks like it’s going to be a reality very soon for many Americans. Want to be kept updated on any advancements in this treatment. Diabetic for over 43 years and feeling hopeful. Freaking Joke!! Just a money maker for the FDA!! I be willing to bet there’s a cure for this Cancer and many more… NASA controlling craft in Mars from Earth and no cure for these deseases that have been around for many moons!!! !